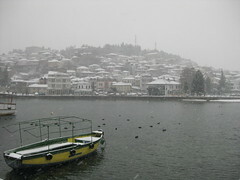 Again a picture taken in Ohrid, Macedonia (FYROM). This time from the pier of the harbor. It started snowing the night before, and the town was covered with fresh snow. The harbor was sleeping, just some snow-covered ships were slowly shaking with the waves. This entry was posted on Dienstag, Februar 9th, 2010 at 00:52 and is filed under Uncategorized. You can follow any responses to this entry through the RSS 2.0 feed. You can leave a response, or trackback from your own site.